We are photographers, but more than that we are artists. At the end of a twelve hour wedding day however, I'd dare to say we not much more than a dollop of goo lying in the middle of the floor. We say "NO MORE" though -- and up from the goo rises a new standard. A new dual camera strap system that balances the weight of your gear more comfortably and makes you look cooler than Steve McQueen. Anders and Lee is a customer service company, that creates the finest quality products, hand made in the USA. 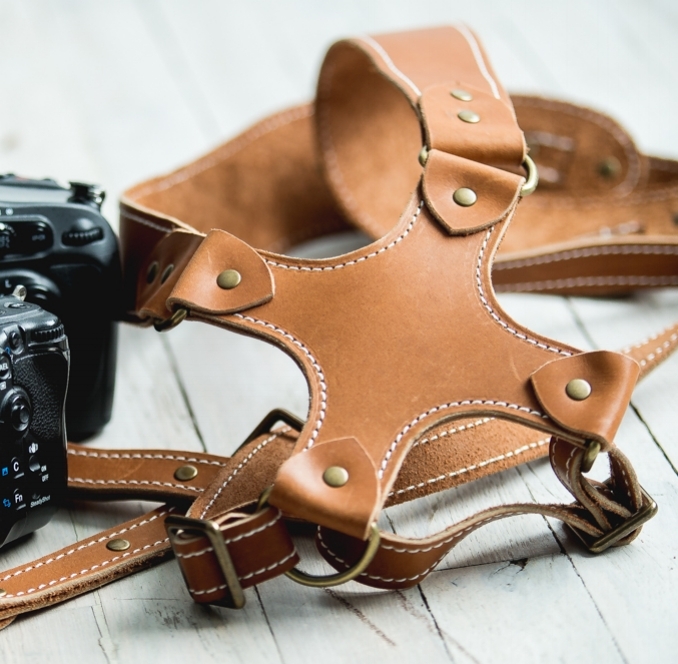 Our customer experience is the foundation of our business and we intend to revolutionize the camera strap industry with all day comfort - luxurious style - lasting a life time. We use only the best leathers for our straps and harnesses. Full grain leather is the original top layer of the leather. Rather than sanding down this layer and artificially applying a layer over to make it look more uniform, full grain leather is whole and authentic. Giving you better life to the leather and letting part of the story stay visible. It will wear and grow with you over a lifetime. All the hardware has a corrosion-resistant finish and is anchored down with steel rivets to make it extra heavy duty. All the D rings are welded for extra strength to secure your gear. Lastly rather than using a buckle or notch system to adjust the size of the harness we use a continuous system and make many different sizes. This allows the leather less stress over time and a more precise fit. To have the best customer service around you start with the highest quality of products, and then surround yourself with an even higher quality group of people. From day one the goal wasn't just to more than make amazing gear for professionals, it was to make life amazing as well. We love everyone that works with us and feel blessed to have them all be part of this journey. Copyright by Anders and Lee LLC, all rights reserved.